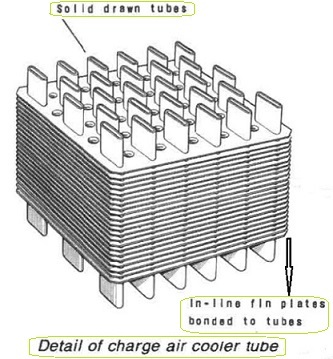 The charge air coolers fitted to reduce the temperature of air after the turbo-charger and before entry to the diesel engine cylinder, are provided with fins on the heat transfer surfaces to compensate for the relatively poor heat transfer properties of air. Solid drawn tubes with a semi-flattened cross section, have been favoured (Figure 1). These are threaded through the thin copper fin plates and bonded to them with solder for maximum heat transfer. Tube ends are fixed into the tube plates (Figure 2) by being expanded and soldered. Cooling of the air results in precipitation of moisture which is removed by water eliminators fitted at the air outlet side. 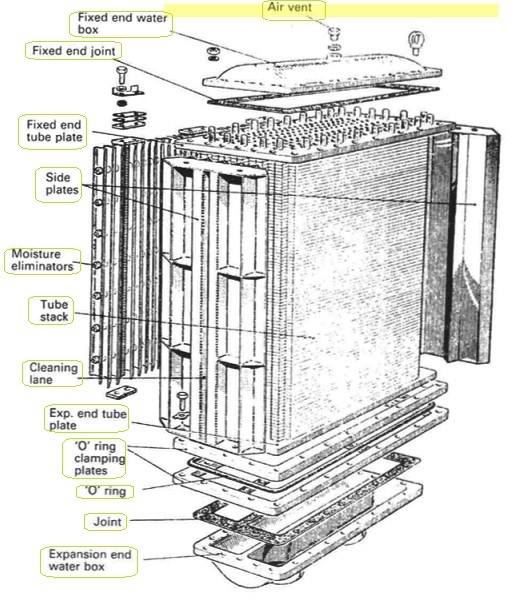 A change of direction is used in some air coolers to assist water removal. Condensate is removed by a drain connection beneath the moisture eliminators.